– Waiter! There’s a hair in my belly! – Excellent, Madam! Would you like a perm with that? Leeks with hair are im-plants. There are actually five of them. A meal of this could cause gastric dis-tress. – Mommy, is Daddy bald? Green Hairs? Leek must be an alien. You expect customers toupee for something like that? Can’t you hear their wheels a squeaking? As the Rabbit said: “I just washed my thing, and I can’t do a Hare with it. A Brazilian may help, or maybe a mower. Maybe your lover will pull them out one at a time, with his teeth. 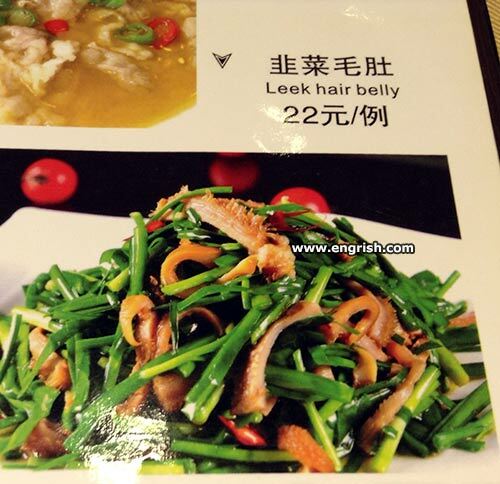 What they really mean is Leek Hillbilly. It is a traditional Welch Highland dish. Recipe by Dirty Hairy & Belly Lasagne, featuring special L’Oral green hair color.